The Vedic concept of peace is a very beautiful one that encompasses not just mental peace for an individual but more importantly the harmonious synergy of the animals, plants, insects, reptiles, birds and other beings around us, as also the stability of the five elements. Thus, the Vedic vision of peace is all encompassing one, where every being takes from, gives to and supports every other being, thus maintaining a natural order and rhythm. In our quest for instant happiness, we find ourselves constantly seeking, yet never finding. For what we believe gives us peace, is ephemeral, and dissolves without warning. True and lasting peace is found within us and also in the deep connections that we forge with the universe around us. This five-day retreat, would be a perfect opportunity for those who wish to experience the healing vibrations of Vedic Mantra-s in an ambience of beauty and serenity. 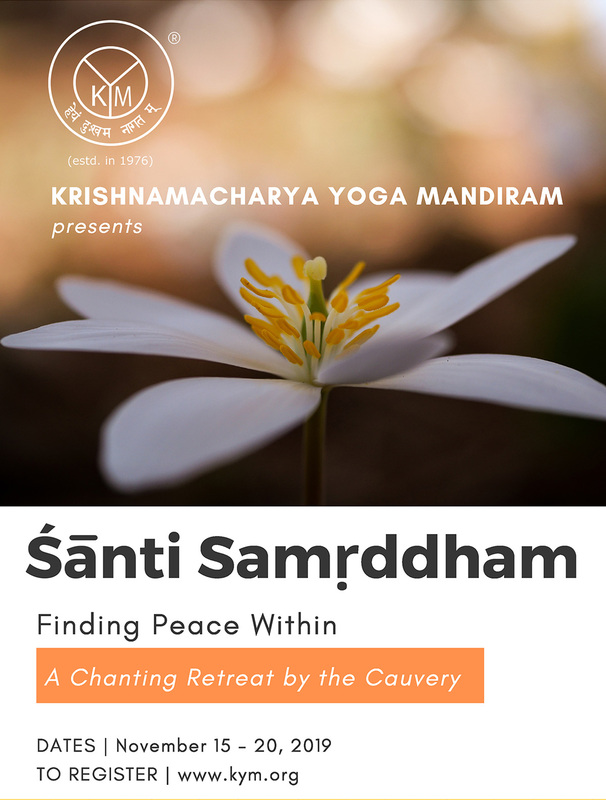 The chants to be taught in this retreat include – select Śānti Mantra-s that promote Ādhyātmika (inner), Ādhibhautika (outer) and Ādhidaivika (universal) peace. No prior experience of chanting or knowledge of chanting is necessary. *Accommodation will be at the Cauvery Sannidhi for Indian Culture, Srirangapatna (about 25 minutes away from Mysuru) on twin sharing basis. Every ensuite room has two separate cots with mattress, pillow and sheets. Participants are requested to pay INR 7,500 directly to Cauvery Sannidhi for Indian Culture towards accommodation and food at the time of check in. This cost is inclusive of accommodation and all meals. Simple vegetarian food will be served. The programme fee payable to KYM is INR 8,500. The participants should reach the destination by the morning of November 15th. The programme commences post lunch on 15th and ends with lunch on 20th. Participants may make their return travel arrangements anytime after lunch on November 20th.